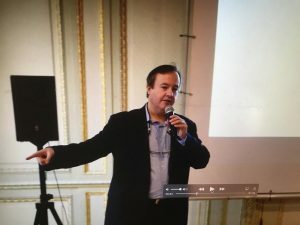 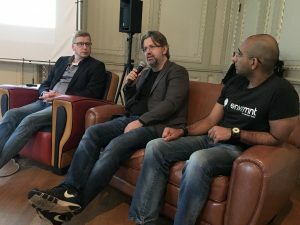 On the first morning of IBC 2017, Chris Pfaff Tech Media and Integer 1 hosted the IBC Video Content Innovation Summit at the Rockstart Accelerator in Amsterdam, which featured some of the leading innovators in the broadcast technology space today, including Vimond; Verizon envrmnt; HCL, and Valossa. 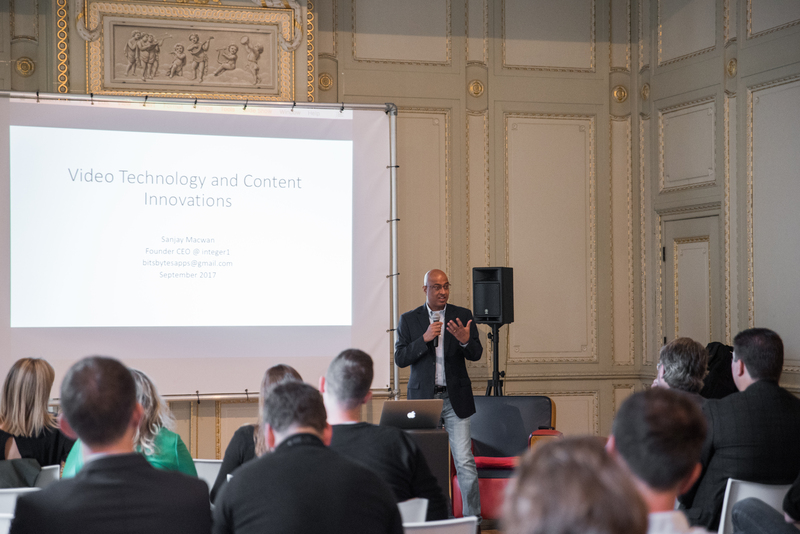 Emceed by Chris Pfaff, the breakfast event, held in the main event room at Rockstart, featured a technology keynote from Sanjay Macwan, focused on the shifting landscape for content distribution and consumption, and presented the audience of 55 producers, distributors, and vendors a view into where global content behaviors are headed. 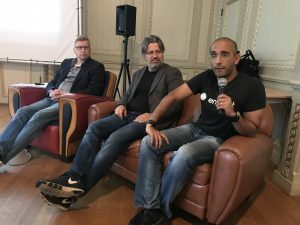 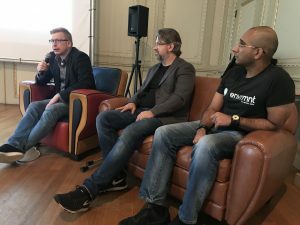 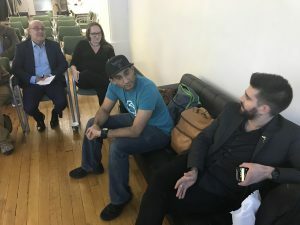 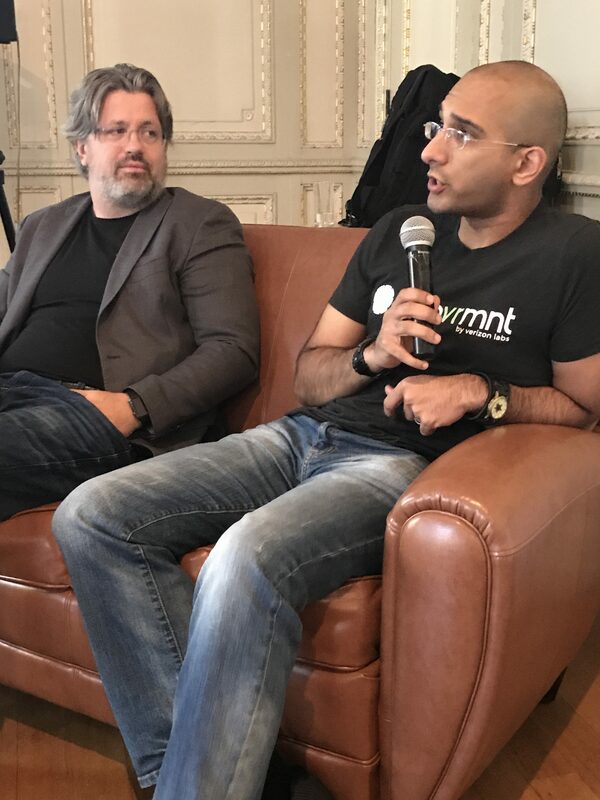 Macwan moderated a panel with Helge Hoibraaten, CEO of Vimond, Mika Rautiainen, CEO of Valossa, and Raheel Khalid, CTO of Verizon envrmnt (Kanwaldeep Kalsi, VP of Media for HCL, could not make the event, due to a delayed flight). 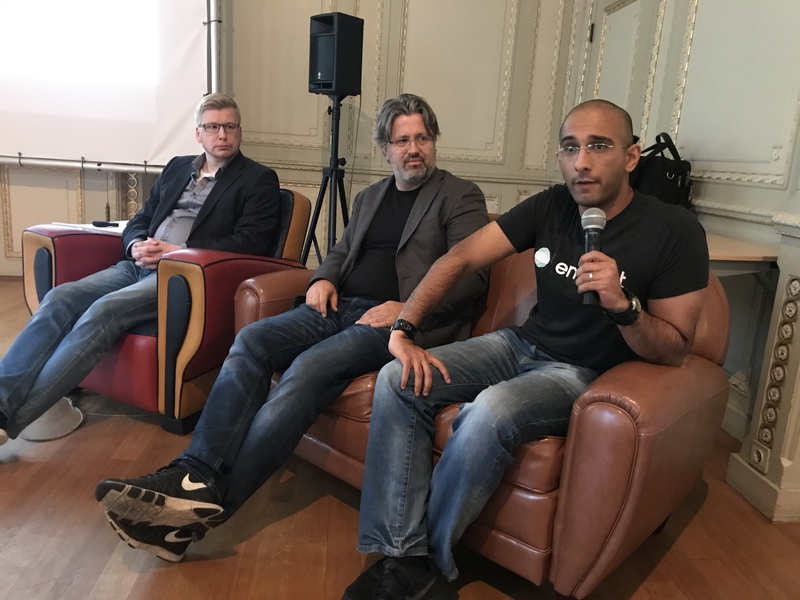 The event literally presented some of the leading figures in OTT (Vimond), VR and AR (Verizon envrmnt), AI (Valossa), and cloud infrastructure (HCL). 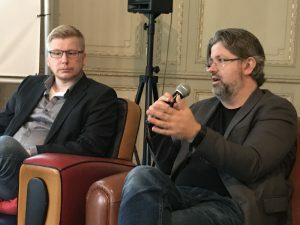 Highlights from the panel discussion included Helge’s discussion regarding content consumption (“we now have all the content we would ever want – in some ways, we don’t have to produce any more”) and content behaviors (“we interviewed teenagers about TV and they said ‘I have everything that I need in my phone'”). 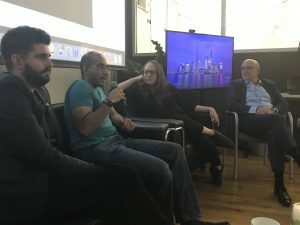 Raheel discussed the issue of every-cinreasing on -demand behaviors, in that people will “not wait for large files to download.” he said that Verizon envrmnt can now stream large-file content by taking game logic and running it on the fly. In this sense, VR and AR content is seamlessly distributed. 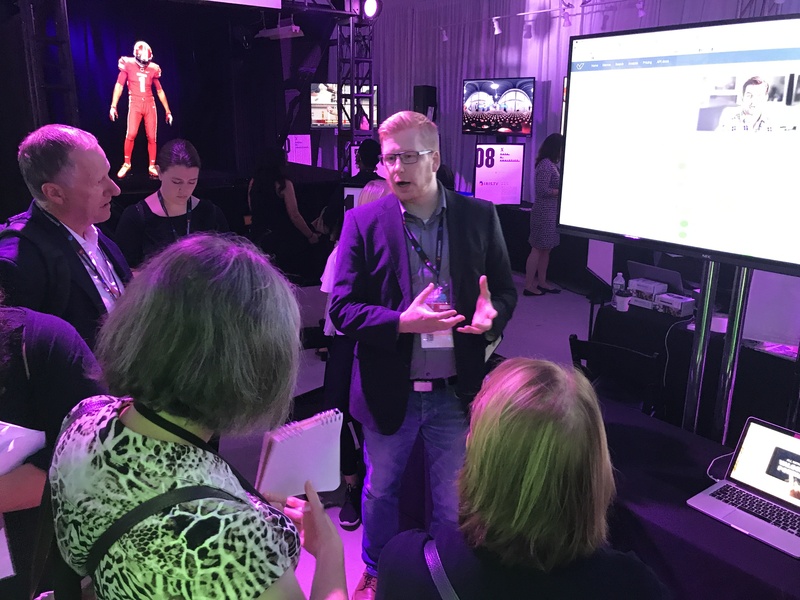 He discussed Verizon envrmnt’s mobile edge compute strategy – which takes 20 milliseconds for a round trip. 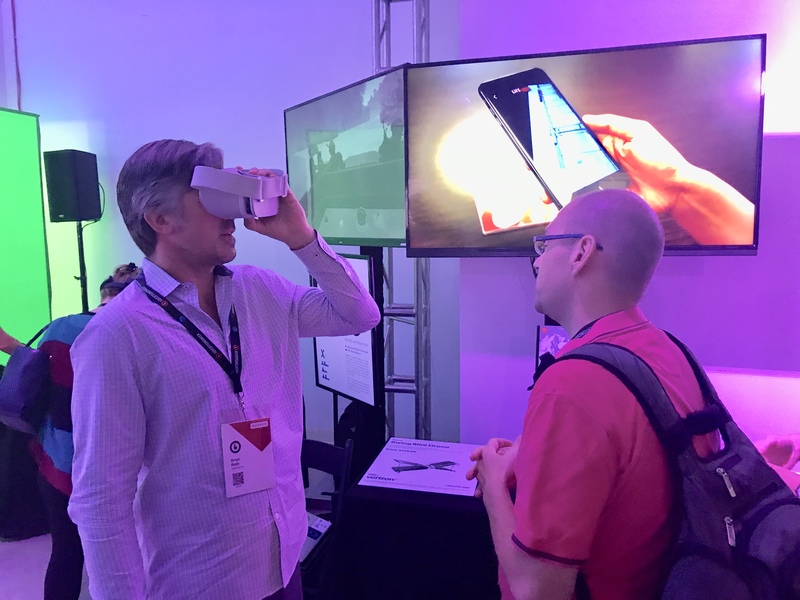 With 5G coming in, 1 gigabit bandwidth will enable VR content to be flawlessly streamed. 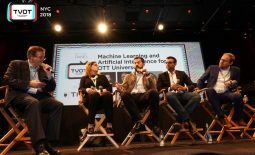 Mika talked about the need to understand how video can be read and how machine learning can train to enable smarter questions around content itself. 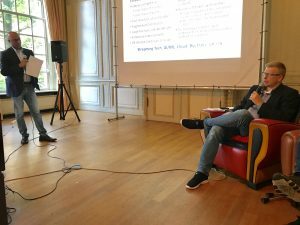 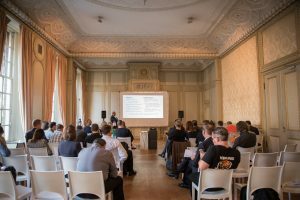 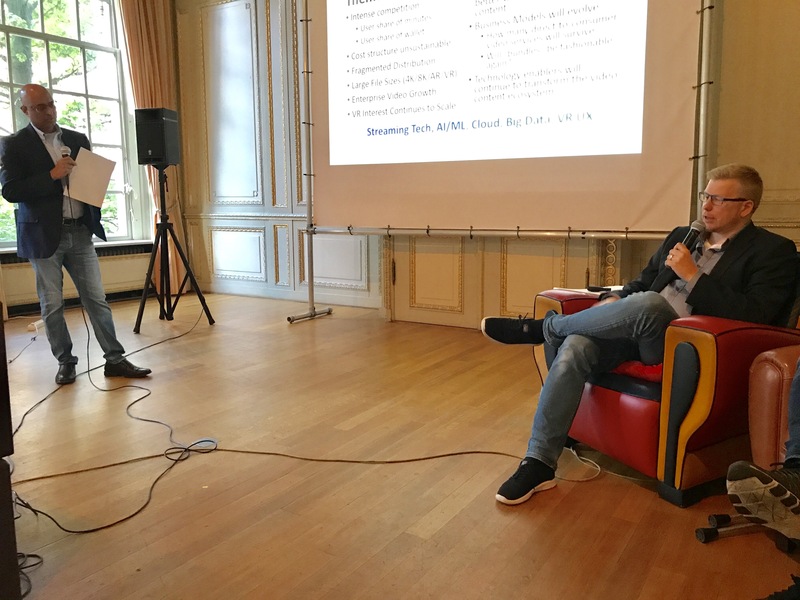 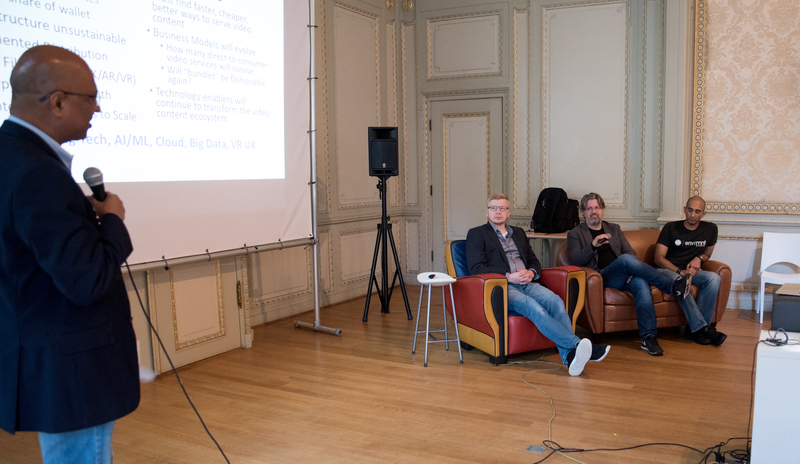 The event was a swan song for Rockstart, as it was the last event in the main room at their 182 Herengracht location (they have since moved slightly north to a larger facility). 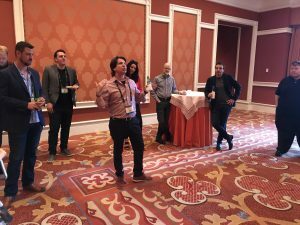 But, it was a kickstart for IBC 2017, and in addition to a good meal, the crowd feasted on some hearty discussion. 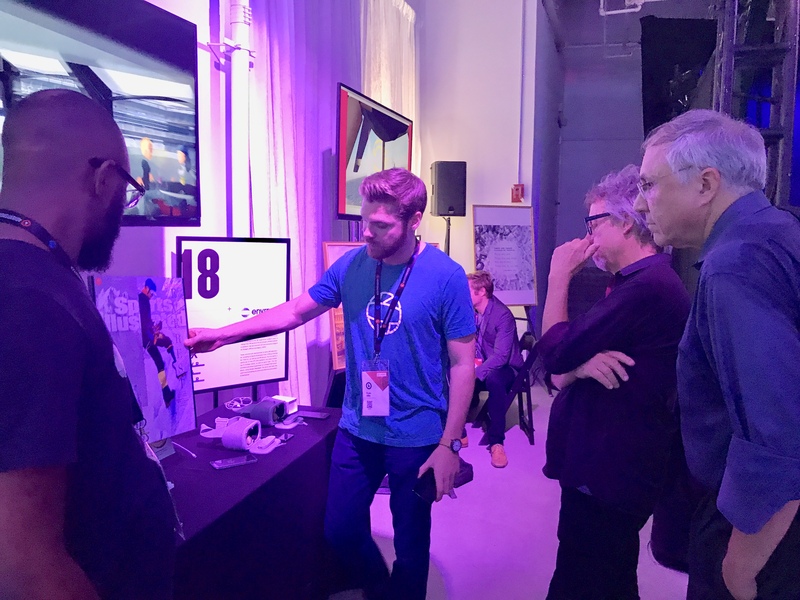 The brainchild of VentureFuel and the Experiential Advertising Group, the Advertising Week New York 2017 TechX experience in Times Square, in a pop-up space between H&M and the NASDAQ MarketSite, curated some of the hippest tech for the ad world, from September 25-28. 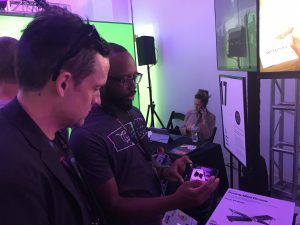 From digital art projects to AR apps to VR tools and holographic displays, the TechX arena offered a wide palette of commercially available experiences for attendees – creatives and media buyers – to play with and understand. The value of TechX cannot be understated: for years, Advertising Week has shunted ad-tech demos into the lower level of the Times Center on 8th and 41st, mainly as an afterthought to the main programming upstairs. 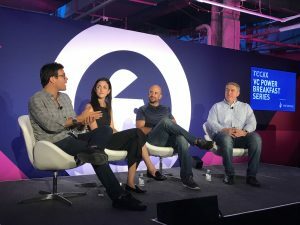 TechX was both long overdue and also groundbreaking in its depth, bringing start-up companies in the immersive and AI worlds into a forum for major brand conversations on the state of the ad industry. showcased the best holographic display technology we have yet seen. Retinad’s VR in-console ad analytics and Tunity’s out of home display audio solution presented measurable technology for audiences underserved, or not yet measured. 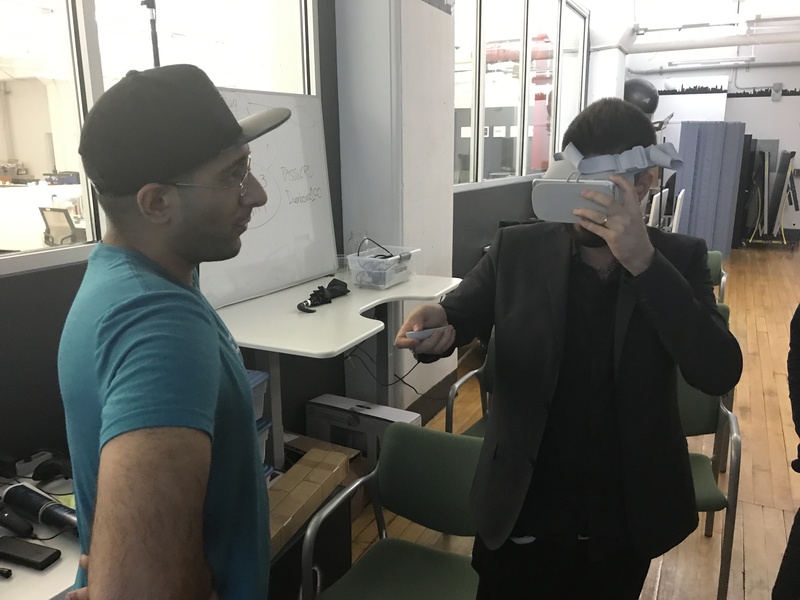 DreamSail Games showcased an expansive VR game environment, and Holosonics presented directional audio solutions. Nestled just steps away from the Times Square bustle, TechX was a rare opportunity to glimpse some of the more inventive ways to deliver and measure ads – and no PowerPoint involved. 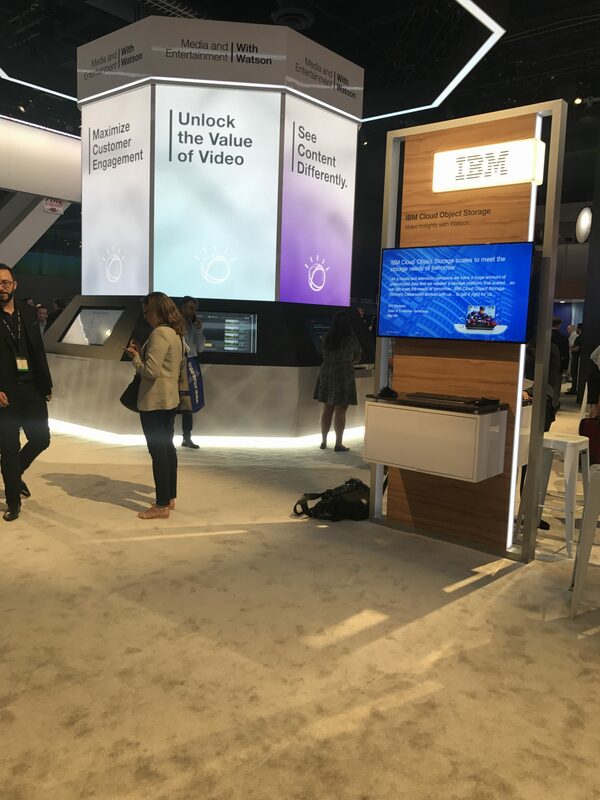 This year’s IBC will likely have more content producers and distributors seeking solutions in AI, VR/AR, OTT, and cloud management. 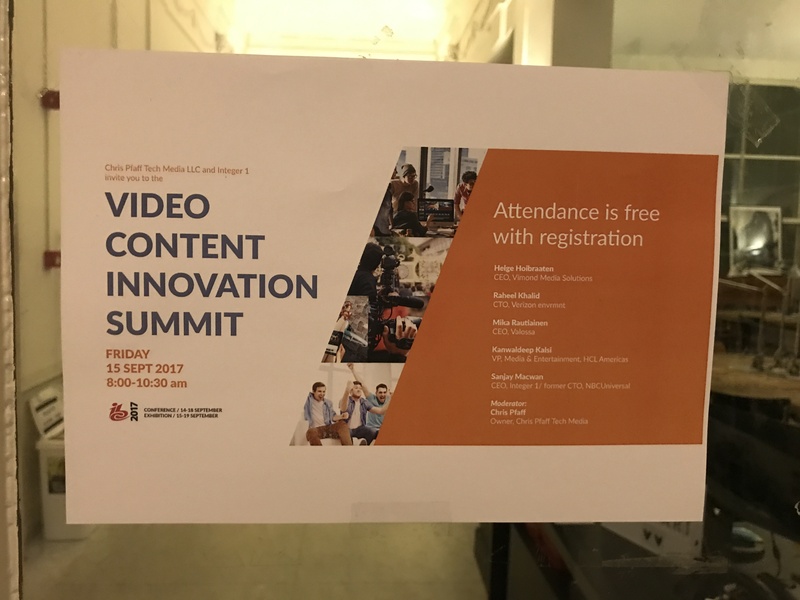 So, in order to help kick off this year’s show right, we have curated some of the leading players in media innovation today, and they are all at IBC 2017 at our Video Content Innovation Summit. Come have breakfast, network with industry peers, and enjoy discussions on the latest in VR/AR; AI for media; OTT; cloud and mobile content distribution and more. 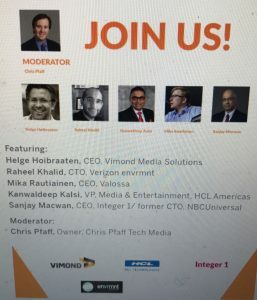 Meet with leading players in the broadcast; cable; OTT, and infrastructure arenas. Our venue is the event space at the Rockstart Accelerator, one of Amsterdam’s main innovation hubs, at Herengracht 182, 1016 BR. 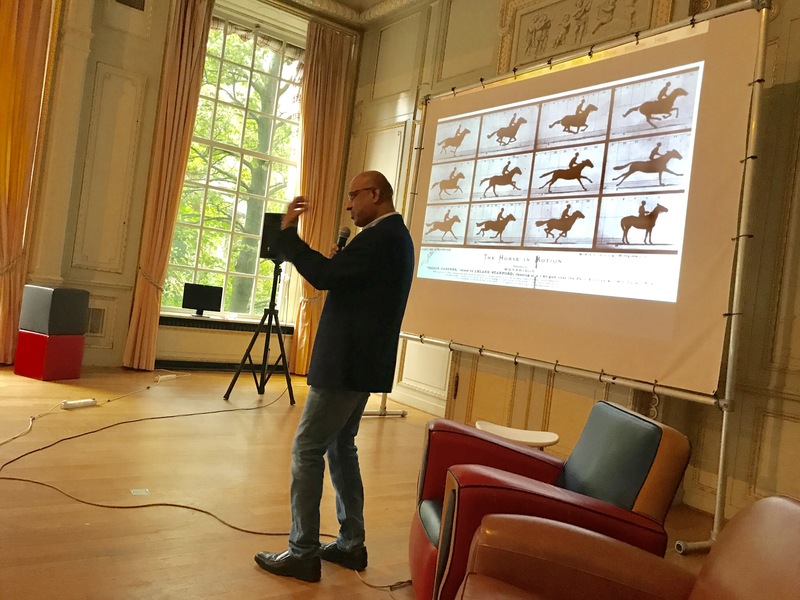 Our esteemed colleague, Sanjay Macwan, will deliver a keynote presentation, and moderate our expert panel. 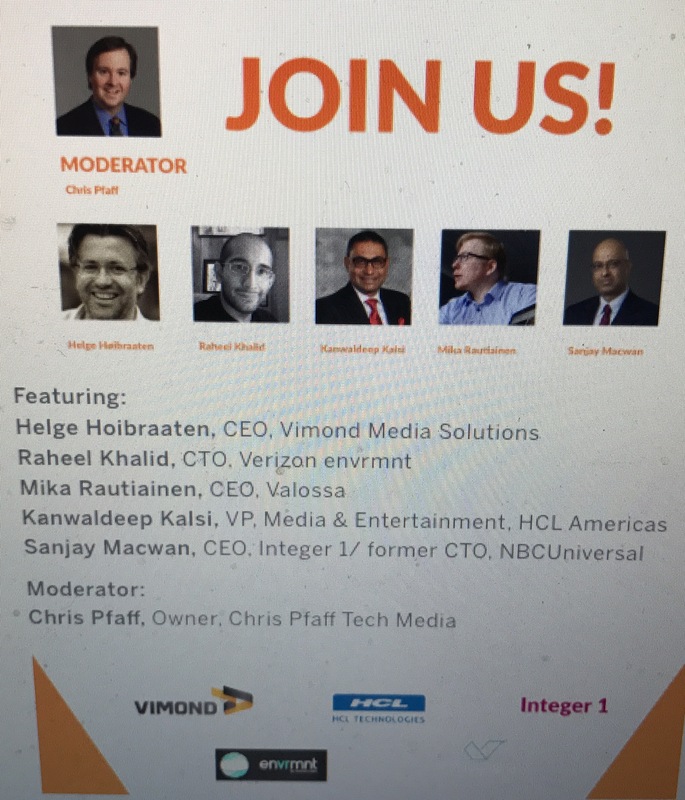 Hosted by Chris Pfaff Tech Media & Integer1. 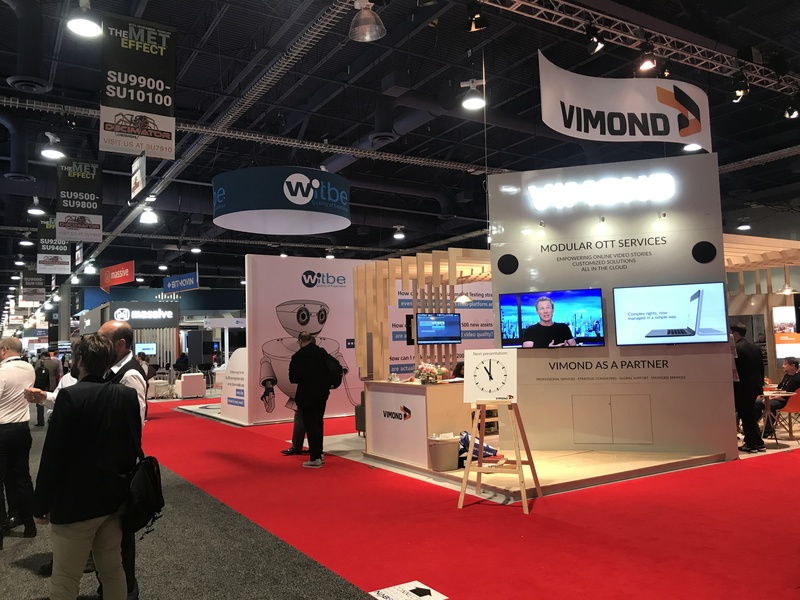 NAB 2017 was one of the more eventful showdowns in Las Vegas in recent years for the pro video industry, even though no monster product launches or titillating vapor announcements were made. 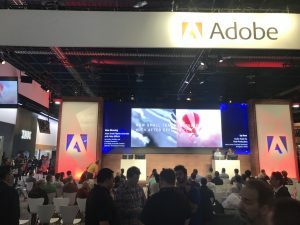 It’s hard to imagine today, but the show that is now a battle for supremacy in the cloud, and in the workflow, was once the place of massive hardware launches. 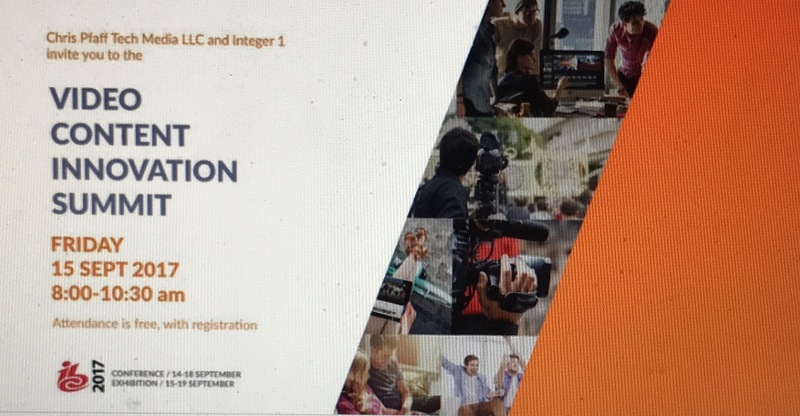 Gone are the days of lines to see the RED camera; the latest Avid or Media 100 editing suite, or Panasonic 3D system. Now, your next technology partner is likely to be the start-up that just cut a deal with Facebook. And, yes, start-ups at NAB are now a thing, not just window-dressing. 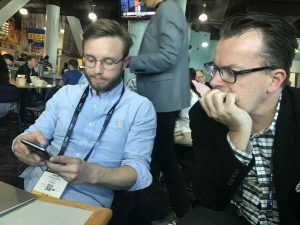 As the media industry, globally, spawns more innovation in the start-up domain, NAB has expanded its Sprockit start-up program, creating a destination in the North Hall of the Las Vegas Convention Center. Facebook took over the South Hall Upper Level corner demo area with a partner pavilion, a cheeky way to cut into the action through FB Live, and other recent F8 unveilings such as Spaces and Camera. 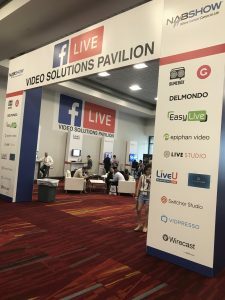 Zuck did not make it to NAB, but it begs the question as to whether he’ll keynote next year, now that Snapchat has gone public. 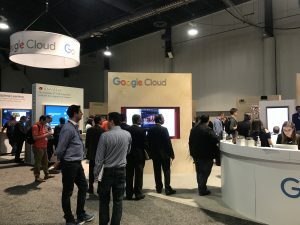 The fact that Facebook was a Nexus toss from the Google booth was more irony; this was Google’s most impressive showing at NAB, and they scared the bejesus out of anyone and everyone who was paying attention. 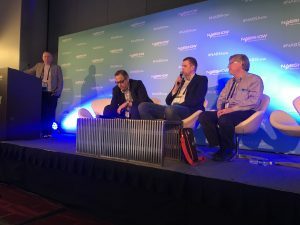 While 8K, HEVC, HDR, and questions regarding the next phases of OTT growth saturated conversations, more and more of the show scratched the edges of “what next?” with regard to 5G, VR and AR as broadcast tools, and AI as a catch-all for whatever ails your product suite. 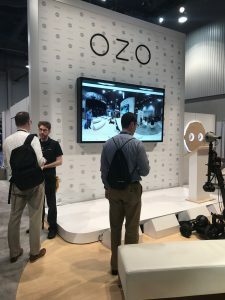 There was certainly less buzz about VR at NAB 2017 than the previous year, but more discussion about cameras, workflow, and services on the show floor. 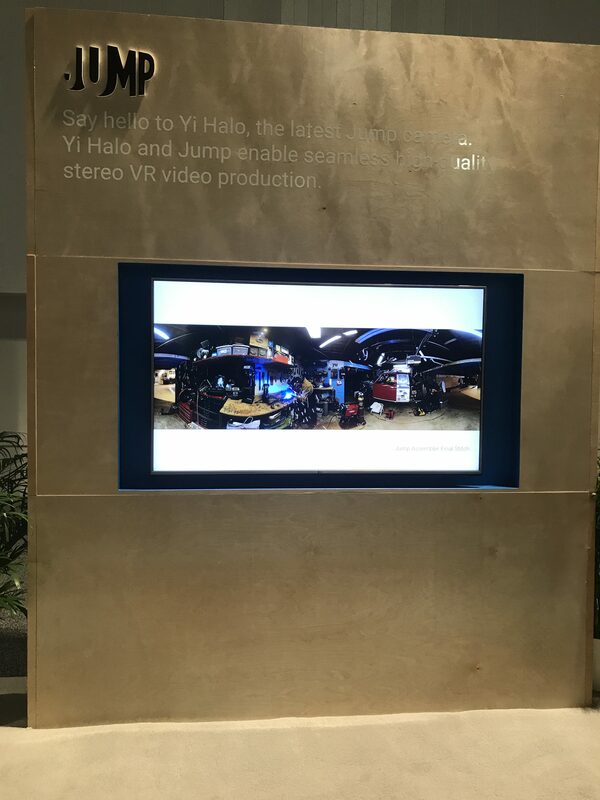 I didn’t even make it to the VR pavilion – as if it really mattered. 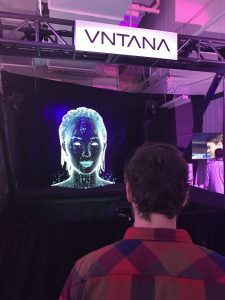 When every major post house and DP worth his/her light gauge is well past their initial VR project, it’s time to get real and send the fairy dust sprinklers back to their bungalows in West Hollywood (or Covina). The same could have been said about drones; this year, the Central Hall hosted a more sober offering of drone purveyors, with less fanfare on hero demos. 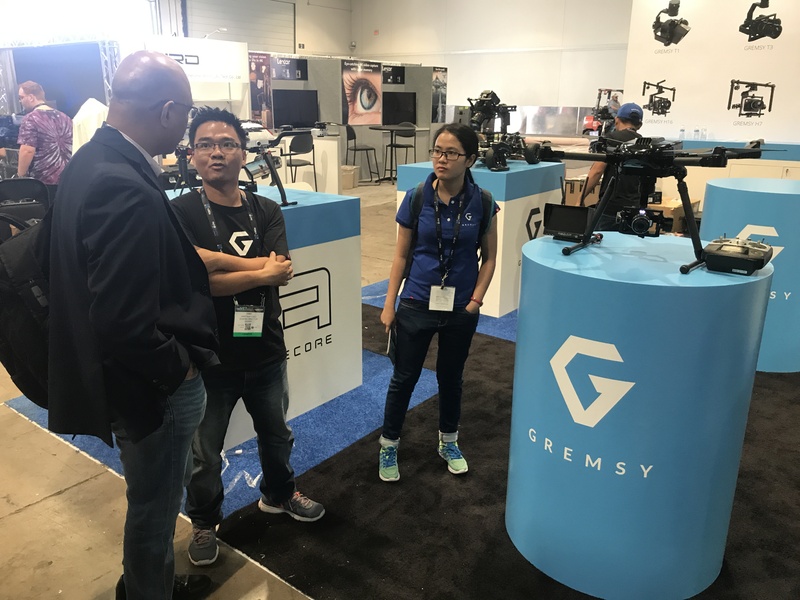 We ran into Gremsy, a Vietnamese drone company, on Sunday morning, with some cool products, and saw little else that had not been seen before. The exhibitors who annually pack in scores of loyal customers – Blackmagic Design, Adobe, Vizrt – were not to be outdone by the likes of Ooyala, who took over part of the outdoor demo area with a pavilion. 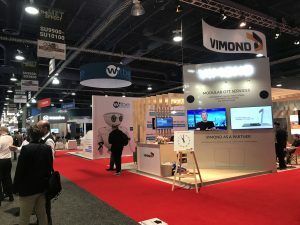 More traffic was seen this year in the OTT services area in the South Hall Upper Level, where Vimond had an impressive display. The telecom world was mostly in the background at NAB 2017, although Verizon had three (because two is not enough) booths at the show, with the Verizon Labs booth featuring streaming VR, via Ozo camera, with the Nokia booth, and more dazzling demos from Verizon envrmnt, which showcased its World Builder demo to great effect. 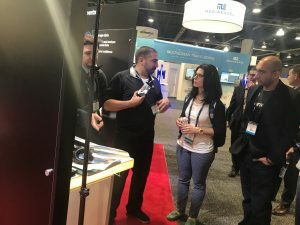 While broadcasters seem to be consolidating to the point of abstraction, Sinclair – which just threw down $3.9 billion to acquire Tribune Media – was making waves with its ATSC 3.0 demos, hoping to assure the industry that technology progress will be made (in addition to massive spectrum acquisition). 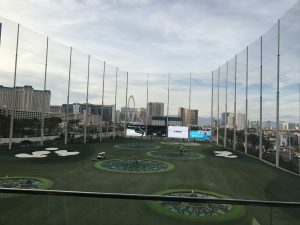 While NAB has not been much of a party scene since the go-go ‘90s, Verizon Digital Media Services threw a huge party at Top Golf, and the Sports Video Group took over the Omnia nightclub for its annual “Pre-Game” bash. 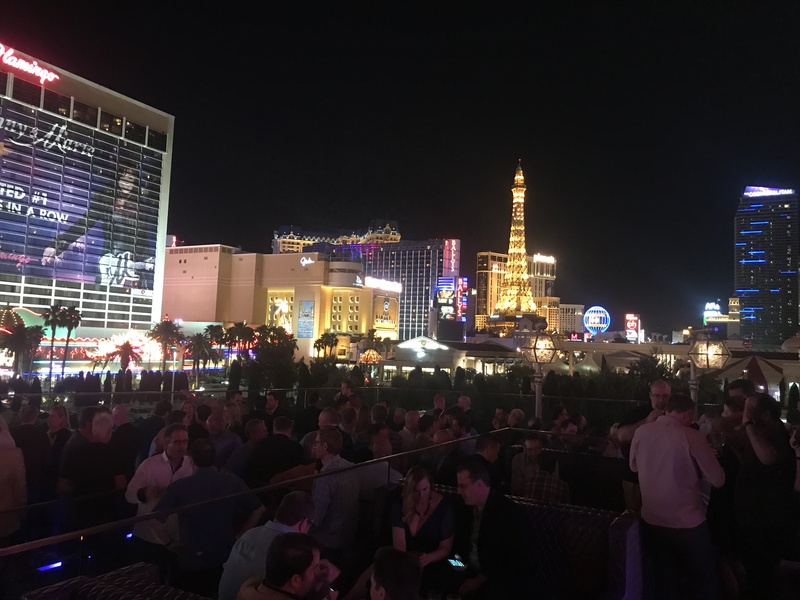 But the real story, for me, was the transformation of the business to the cloud, whether AWS, Azure, Google, or Dell EMC, or others. 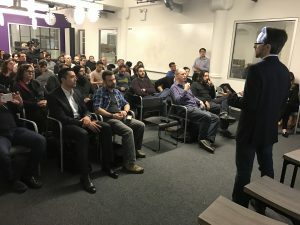 The applications and innovations delivered by these bedrock services are multiplying, and driving further investment, and starting to fulfill dark fiber long laid in anticipation of something big. Something big has already arrived, though, and it’s going to require more space – up there in the cloud. There was an aspect of expectation to Mobile World Congress (MWC) 2017 in Barcelona that went far beyond the usual trade show hype. 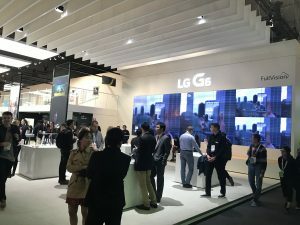 With the mobile world encompassing everything in our technology universe, MWC 2017 very quietly – and firmly – showed that the mobile ecosystem can, and will, show the way forward. All of that hype about VR and super mixed reality last year? We have greater clarity this year – from Samsung Gear to network operators such as Verizon and Orange. Augmented reality seemed too much too soon last year? 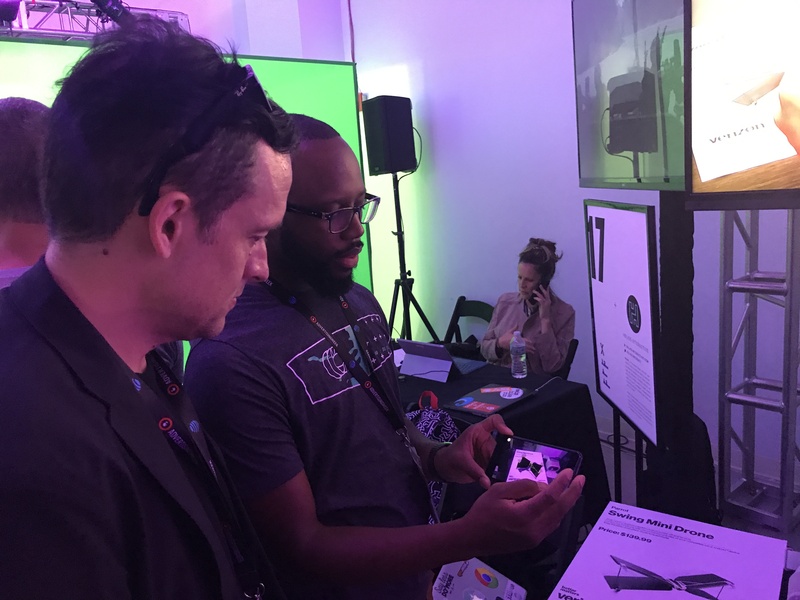 We now have more AR implementations, and more interest and demand in AR now than ever before. 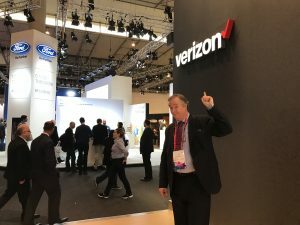 5G yet another acronymic bamboozle? 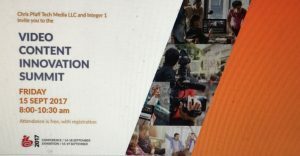 It will take a while, for sure, but it’s coming – this year. 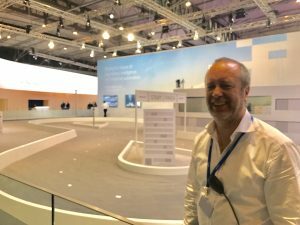 MWC 2017 was a watershed, in its own quiet way. 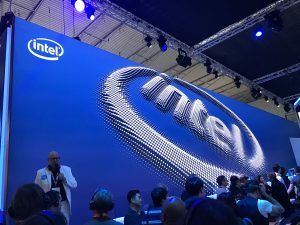 And it’s not just the big boys who are spurring innovation. 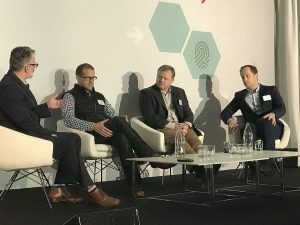 Qualcomm and Intel duked it out near each other, as always, but while the companies shared as much of the stage in the IoT, smart auto, AI shuffle, it was more evident than ever that the European start-up ecosystem was making major strides in the mobile SDK world. 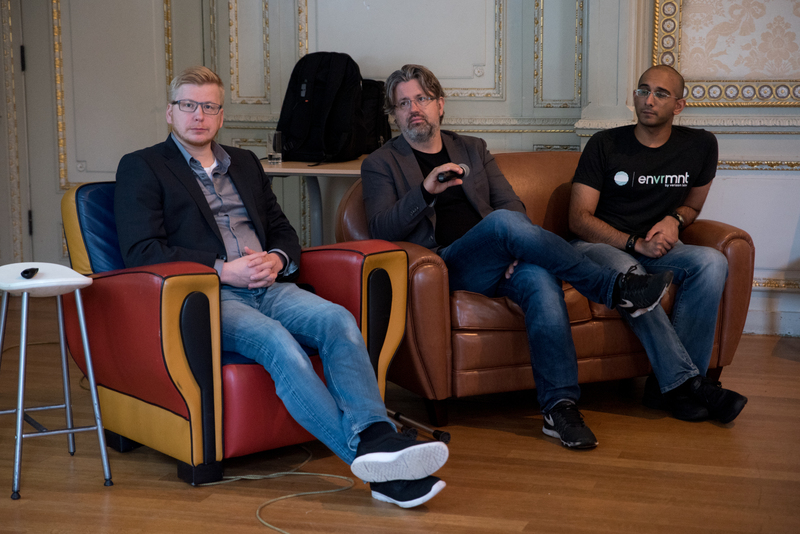 From gesture recognition (the Swedes showed off Manomotion and Crunchfish) to intelligent location (Finland’s Quuppa), we are seeing more efficient delivery of complex experiences, driven from European university spin-outs and venture-backed start-ups. 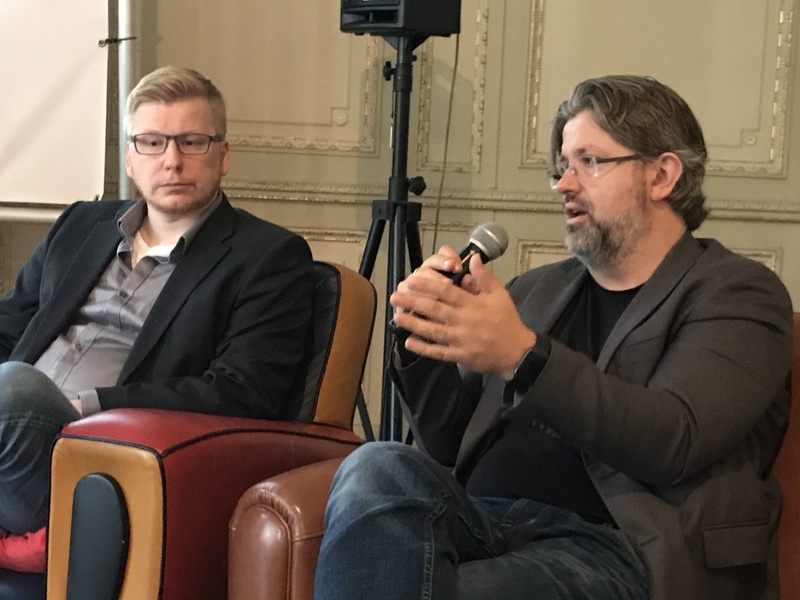 The week was endless, as usual, and started with GSMA’s event at the Pullman Barcelona Skipper Hotel, and an excellent panel moderated by Bonfire Lab’s John Gilles, on VR/AR, paneled by Verizon Ventures’ Ed Ruth; Oculus’ Andy Mathis, and Ericsson’s Per Borgklint. 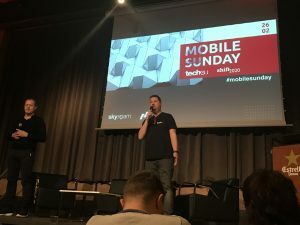 Mobile Sunday, at the Estrella Damm event center, saw a critical mass of people – investors, start-ups, and analysts – with a mass of new faces. 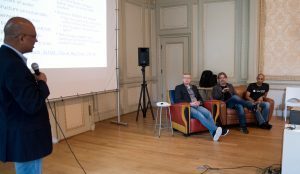 Kudos to Robin Wauters and Rudy De Waele on growing this event into a seminal MWC gathering. 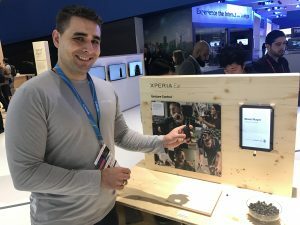 With the entire world worried about cybersecurity’s ability to take on new threats, the mobile world had more answers at MWC 2017, including solutions from Estonia. 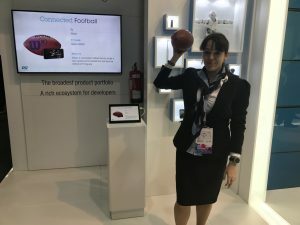 More network-based innovations for smart cities and IoT were on display from everywhere – from SK Telecom to Huawei. 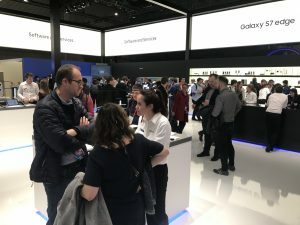 The device manufacturers did not boffo announcements, but incremental progress – from Sony’s Xperia accessories to LG and Samsung’s forthcoming tablets – and the nostalgic hype for the Nokia 3310 and the new BlackBerry device showed the diversity of the market. 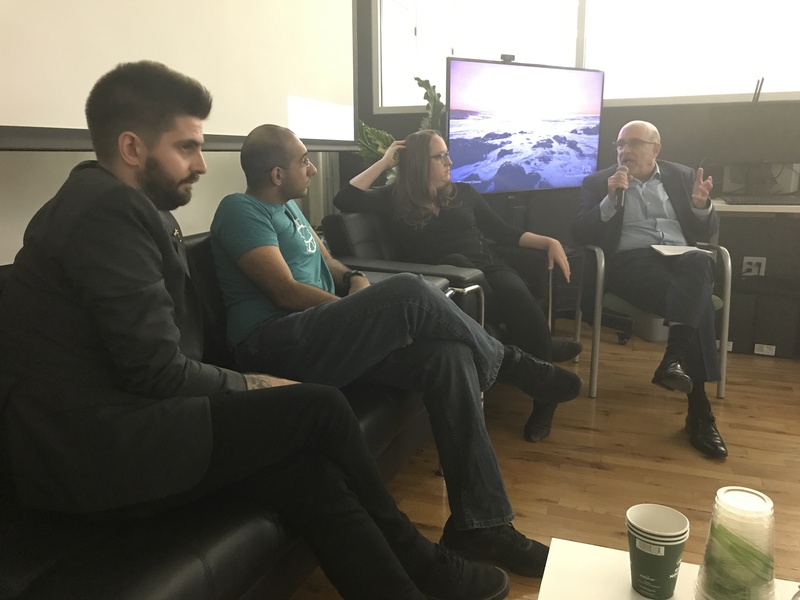 Oddly enough, two of the biggest statements at the event emanated from New Jersey: Verizon and Nokia Bell Labs. 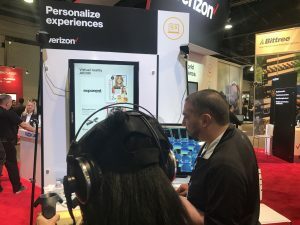 Verizon’s stand was a show of innovation, from its telematics group to smart city and IoT solutions to the new holding company, Exponent, which will deliver service architecture for other carriers. The company’s envrmnt studio, and end-to-end VR/AR offering, will be part of Exponent. 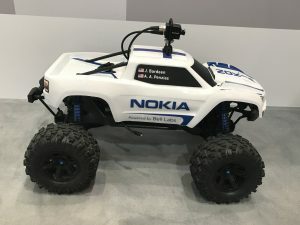 But, overall, the most stunning statement made at the show was from Nokia. 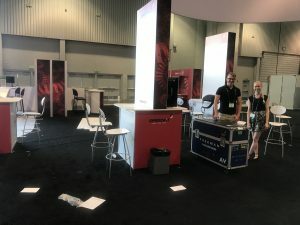 Its stand was a testimony to new ideas and even a new attitude. Bell Labs shined with its race track demo, which had radio-controlled cars (cheekily named after Bell Labs luminaries, including Claude Shannon) powered over 4G and 5G networks, showing the efficacy of network controls. 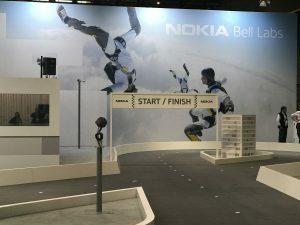 Nokia, which acquired Bell Labs and the old Alcatel-Lucent entity last year, has already rebranded and repowered Bell Labs, and it was evident at MWC 2017. 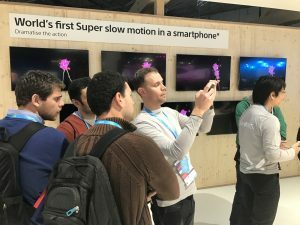 We can only hope that the coming year will deliver more experiences powered by network innovation, which was quietly the star at MWC 2017. 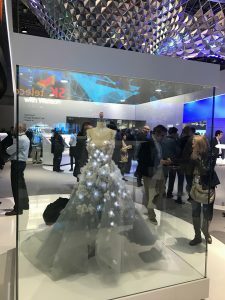 IBM’s Watson story has increased since last year, and drew flocks of people to its psychedelic-meets-Deco booth, complete with the “cognitive dress,” which is designed based on user’s moods and whims. 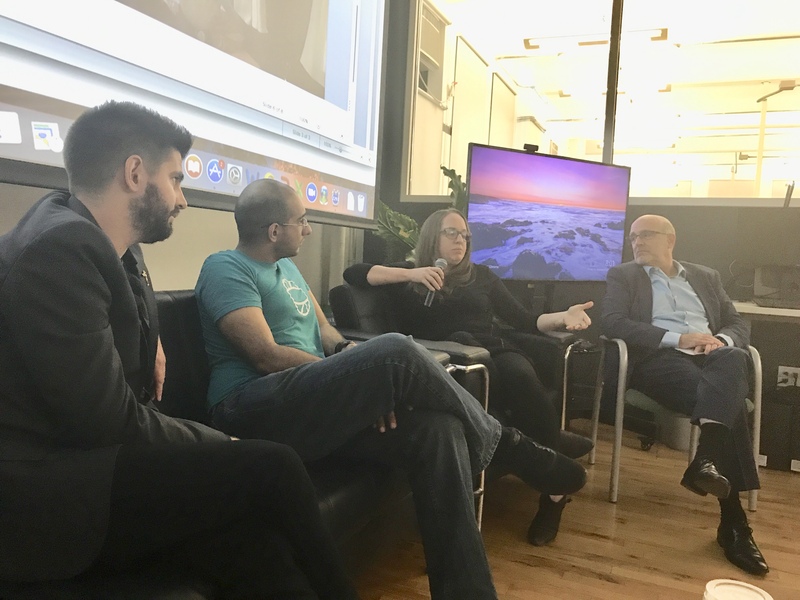 The first VR/AR Association New York Chapter event of 2017, ‘Virtual Reality for Producers: How to Create and Deliver for the New Content Frontier,’ took place last Wednesday night, February 15th, at the NYU Data Futures Lab, and it delivered not only a full standing-room-only crowd of 95 people, but some of New York’s finest producers working the VR scene. 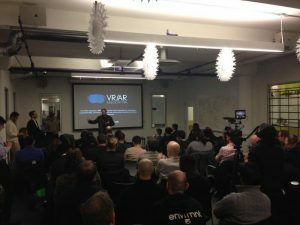 As more New York producers learn the craft of producing in VR, the industry will grow concomitantly. Wednesday’s session was an ideal session for learnings from the likes of Paul Cheung, direct of interactive at Associated Press (AP); Alissa Crevier, global head of partnerships, at Littlstar, and Christian Egeler, director of VR/AR product development with Verizon envrmnt. 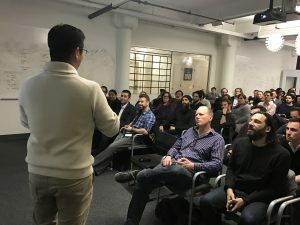 Paul Cheung guided the audience through his learnings with the almost dozen VR cameras that he and his team have tested. 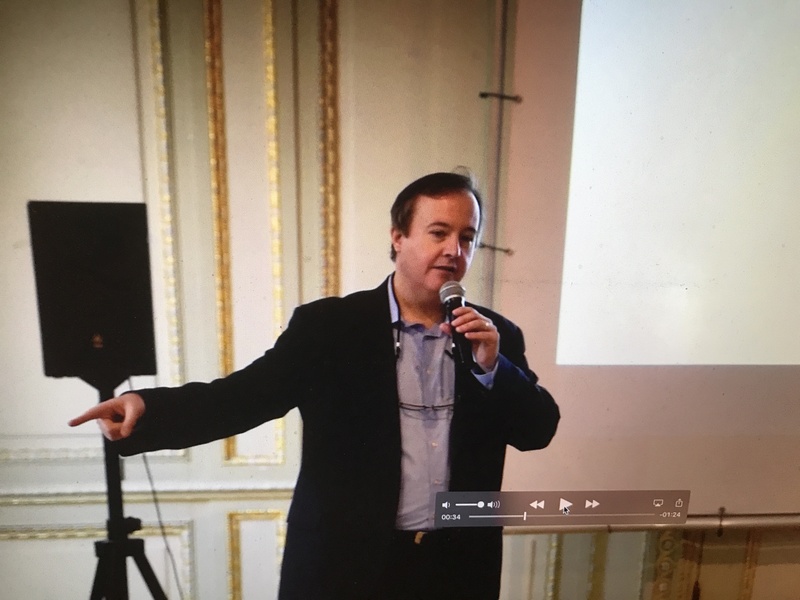 He discussed some of the work that AP has done with branded content partners, and how to adapt the standards of the AP (an organization that literally developed the journalistic standards known as “AP Style” over the past 180-plus years) to VR production. In other words, while shooting a scene, do you keep the DP and/or the producer in the shot, or matte that out? 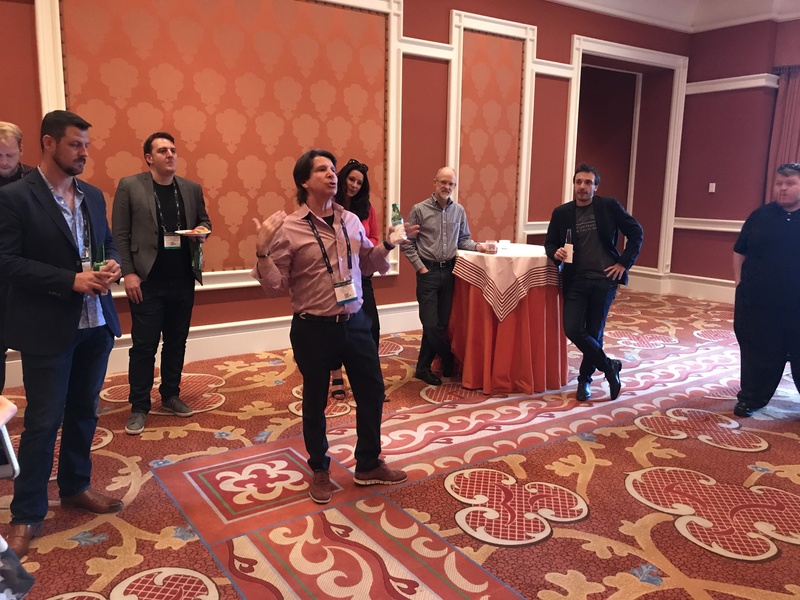 For AP, that choice is obvious: leave the production team in the frame. 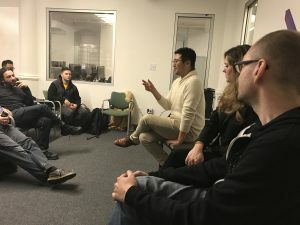 Cheung described some of the learnings in VR as they apply to the overall production work that his interactive has to deal with, enabling a smoother workflow scenario. 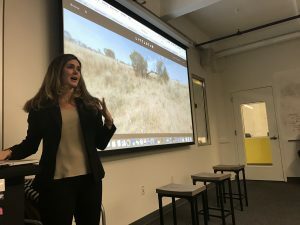 For Alissa Crevier, Littlstar’s work has grown to the point where the company is as much a platform for content as it is a stand-alone producer of VR content. 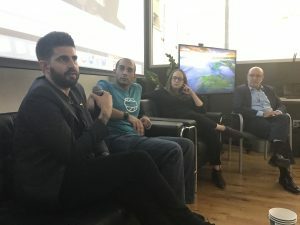 This has created a new kind of channel for VR partners, and the Littlstar roster of clients includes the who’s who of major content distributors, including Disney/ABC, Discovery, Nat Geo, Showtime, and the Wall Street Journal, among others. 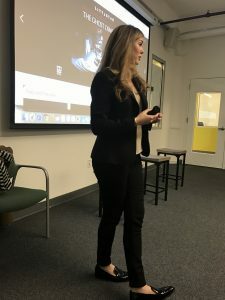 Crevier’s experience with Spotify, and the music industry in general, have helped her navigate clearances and understand the vagaries of the live music scene, and live streaming, to understand the value of WebVR versus individual VR platforms, such as Oculus, Gear, or Vive, among others. 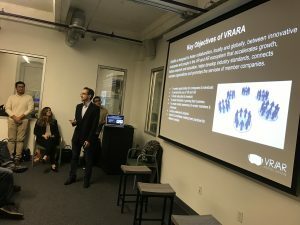 Christian Egeler took the audience through the Verizon envrmnt learnings, and how they have applied to the studio’s growth in areas that include their Social VR platform. 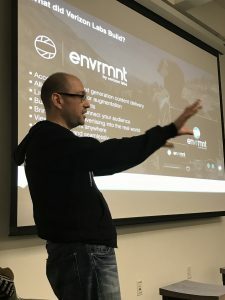 The envrmnt cross-platform SDK has gained traction in the industry, including with the March, 2017 issue of Cosmopolitan magazine, which includes an AR app, a native app, and integrated envrmnt SDK so that trigger images are easier to recognize. 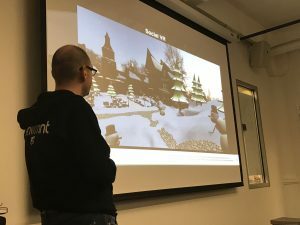 Egeler also showed an Alpine Village demo with dynamic updates (first showed at the Amazon Web Services Invent and Nvidia conferences). 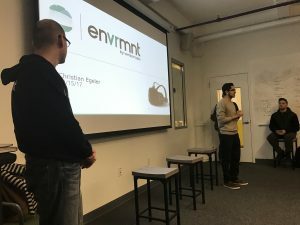 He hinted at the possibility that envrmnt might release a “build your own” 3D engine later this year. A VR experience produced for Super Bowl LI was also demonstrated. 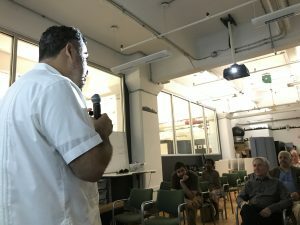 The audience, mostly comprised of producers, was intrigued by the experiences that the three presenters had. 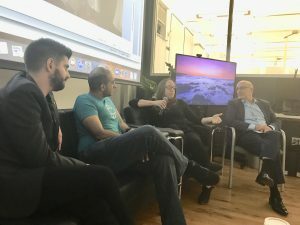 The lively panel discussion dove into issues surrounding the growth of an industry that still has yet to standardize areas of production and post-production, as well as the growth of WebVR, in the wake of a still-early headset market.